MANILA, Philippines - LET RESULTS. 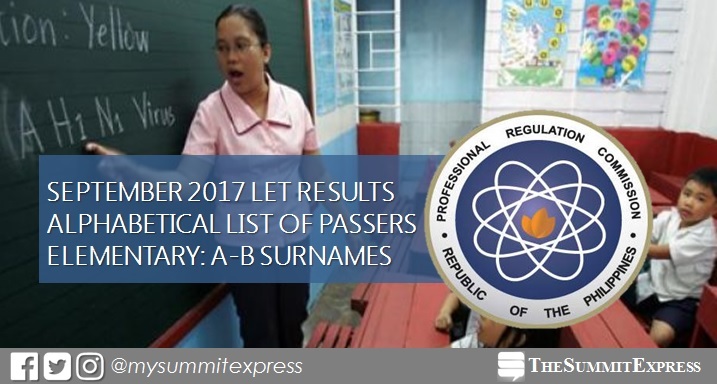 The Professional Regulation Commission (PRC) and the Board for Professional Teachers (BPT) officially announced on Monday, November 27 the list of elementary teachers who have successfully passed the Licensure Examination for Teachers (LET) given last September 24, 2017 in several testing centers all over the Philippines. The complete list of passers for Elementary Level is available online. View on this page the alphabetical roll of passers for A to B Surnames. Registration for the issuance of Professional Identification Card (ID) and Certificate of Registration will be from December 4 to December 8, 2017 for Elementary Level. You may also register at the PRC Service Centers in Robinsons Place Manila, Robinsons Galleria, and in Clark Skills Training Center (formerly Polytechnic College, Clark, Pampanga). Likewise, the following campuses shall also serve as venues for initial registration from December 4 to December 15, 2017: Arellano University – College of Education in Sampaloc, Manila; University of Santo Tomas – College of Education in España, Manila; Technological Institute of the Philippines – College of Education in Quezon City; Philippine Normal University – College of Education in Manila. The September 2017 LET covers two parts for Elementary - General Education (40%) and Professional Education (60%). In order to pass the LET, an examinee must obtain an average rating of not less than 75% and must have no rating lower than 50% in any of the tests, PRC said. Based on PRC Resolution No. 2016-1019, the target release date of September 2017 LET board exam results is on Monday, November 27 or in 43 working days after the test. But due to government work cancellations and the country's hosting of the ASEAN Summit, release of results may be delayed for some days. Reliable source and the 'ultimate reviewer' of CBRC Dr. Carl Balita hinted on his Facebook posts that results may be released until November 28. On November 18, Balita shared: "nasa mga KAMAY mo na ang Lisensya." It pertains to the total number of fingers which is 10 before the much-awaited results. Latest post said: "When the digits sum is summed up to ONE, the DREAM and the DREAMER become ONE." All takers of the LET board exam (passers, non-passers and removal) may verify their ratings online. Enter the required information to verify your identity. Note that this will be available in few working days after the release of results.